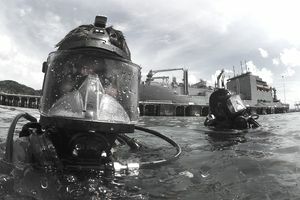 Navy Fleet Divers (NDs) perform underwater salvage, repair, and maintenance, submarine rescue, and support Special Warfare and Explosive Ordinance Disposal while using a variety of diving equipment. They also maintain and repair diving systems. The motto of the Navy Diver community is “We dive the world over”. Because divers may be assigned to any part of the world, their environment will vary as widely as water conditions: cold, muddy waters where underwater tasks can be completed by feel only, or warm, tropical waters clear enough to perform underwater photography. After completion of Second Class Diver training, graduates are assigned to salvage or repair ships, Mobile Diving and Salvage Units, aviation water survival training, or to EOD/SEAL support. After as little as two years, Second Class Divers are eligible for First Class Diver training which leads to an assignment in a variety of jobs requiring advanced knowledge of diving systems. Candidates may also volunteer for ND during basic training at Recruit Training Center, at A-school, or at any time during their enlistment prior to their 31st birthday. In-service recruiters (Dive Motivators) at RTC give presentations on the Navy's diver programs, conduct the physical training screening tests, and assist interested people with their applications. People who enter the Navy in the nuclear, advanced electronics, or other five or six-year enlistment programs are not eligible for diver programs. Advancement opportunity and career progression are directly linked to a rating's manning level (i.e., personnel in undermanned ratings have greater promotion opportunity than those in overmanned ratings).